Donate and enjoy Unique Opportunities (see below) ! Heritage is a valuable resource, especially in economically challenged areas. Collaborating with academics and local teachers, we create educational resources so pupils can learn about their history and heritage. This gives them a sense of identity and pride in their past. It also provides them with valuable tools for their future. 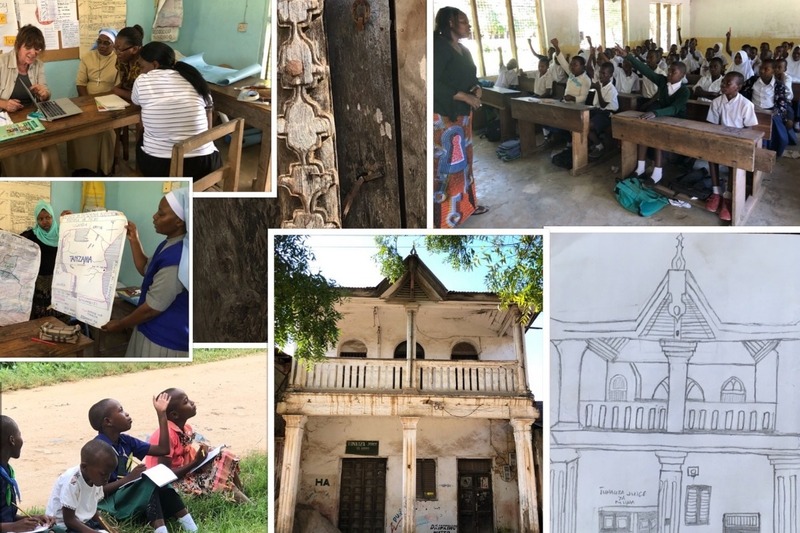 In July I spent 3 weeks in Pangani, Tanzania, visiting schools and talking to teachers - most had little knowledge of the splendid built heritage around them. We discussed which materials would be most appropriate for their pupils; I wanted to be sure that what we produced would be welcomed and used. 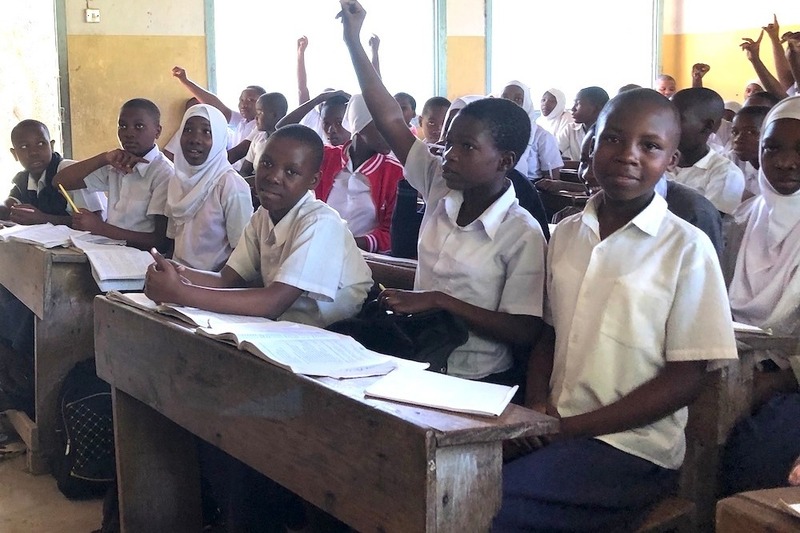 The teachers asked for materials to stimulate and develop pupils' critical thinking skills so they will become reflective enquirers, vital for their progress to higher education. So, we have planned comprehension exercises, activity sheets and a number of posters, together with teachers' notes and some teacher workshops when we return. I also spent a week-end with groups of school-children, walking, talking and sketching the historic buildings. The local NGO, Uzikwasa, wishes to develop this and other programmes for children in their Heritage Cantre, so, on our next trip, we will also be working with their staff to facilitate this. We have solid plans ... but none of this will be possible without funding. All donors will receive regular updates. Donate £50 and you will receive a photograph of one of the classes you will be helping. Donate £350 and receive a souvenir booklet of photos of the historic buildings and the schools you help. Donate £550 and you can attend the Day Conference, with lunch, in Cambridge in May: Digging Deeper into the East African Slave Trade. This is your chance to meet the team and learn more about the research and plans to introduce Heritage to the classrooms. Would you like to join us in Pangani ? This is your opportunity to participate. Come and see the built heritage for yourself and visit some of the schools with us. Donate £1650* and you will be hosted† in Pangani for 5 days, interacting with locals, exploring the cultural heritage and visiting the schools with us. You’ll also receive a certificate of participation. Special offer - be one of the first ten to want to join us and donate only £1250* to do so ! So, please help: any donation will enable us reach our goals and make an impact. More information: ArchaeoLink assists communities to obtain educational, economic and societal benefits from their archaeology, heritage and culture. We liaise between archaeologists and the communities in which they work, to facilitate knowledge exchange. Thus we empower the communities to recognise, select and accomplish achievable goals aligned to educational, societal and economic benefits. You are donating to PayPal Giving Fund UK, a registered charity (No. 1110538), which will email you a receipt for your donation and claim Gift Aid where eligible. GoFundMe’s platform is free. The charity will typically receive the funds from PayPal Giving Fund within 15-45 days of your donation if the charity has enrolled (or 90 days if the charity has not yet enrolled). Unlike other platforms, 100% of any Gift Aid will go to the charity as well. * In very limited cases, a recommended charity may cease to meet PayPal Giving Fund's legal or other eligibility requirements. In such cases, PayPal Giving Fund will reassign the funds to a similar charity, and (wherever possible) seek a new recommendation from donors.